Leek is one of those ingredients that have found it's place as a pantry staple in my kitchen. I starting buying a few stalks of leeks a couple of months ago to use in place of onions in some recipes. I like the subtle flavor. 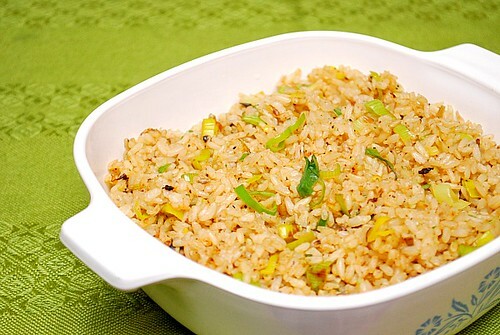 In our house, garlic rice pilaf is a common side dish. I decided to take the last leek stalk I had on hand and throw it into a garlic rice pilaf I made and it worked out pretty well. The leek imparted a subtle onion flavor while adding some nice color in the dish. So if you're not too familiar working with leeks, this is a great recipe to start! Press SAUTE and add butter and olive oil. When butter has melted, add the leeks and garlic and season with the salt and pepper; cook until the leeks are soft, about 5 minutes. Add the rice and stir until coated with the butter and olive oil. Stir in the broth and secure the lid of the IP and ensure the valve is set to SEALING. Press MANUAL and adjust the time to 12 minutes on HIGH pressure. Once at pressure, the display will reflect 12 (the number of minutes you initially set) and will begin to countdown to 0 minutes. When the IP beeps after pressure cooking for 12 minutes, allow your IP to naturally release pressure. While naturally releasing pressure (also known as NPR or NR), the display will reflect numbers counting up from 1. The numbers indicate how many minutes the IP has stopped cooking since it beeped (or how many minutes it has been naturally releasing pressure). No need to touch your IP while it naturally releases pressure. The pin at the top of your IP will drop when all pressure has been released and it's safe to open.